Nothing beats the taste of freshly baked homemade cookies. These crisp and crumbly treats are packed full of chunky white and milk chocolate pieces. Preheat the oven to 180°C, gas mark 4. Using a piece of kitchen paper and a little vegetable oil, grease 2 baking sheets. Chop both types of chocolate into chunky pieces; you might find it easier to break it into squares first and then to cut each square. Put the butter and sugar in a bowl and beat with a wooden spoon until pale and creamy. Beat in the egg, scraping in all the mixture from around the sides of the bowl. Add the flour, baking powder, cocoa powder and oats and stir until well mixed. 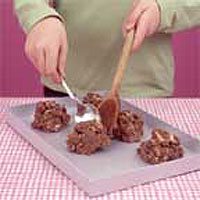 Sprinkle the chopped chocolate and the nuts into the bowl and stir to form a stiff paste. Take a spoonful of the mixture and place it on one of the baking sheets, pushing it off the spoon with another spoon. Place 8-10 spoonfuls on each sheet. Space them well apart so that the mixture has plenty of room to expand during baking. Bake for 10-12 minutes until risen and 'craggy'. Using oven gloves, carefully remove each batch of cookies from the oven. The biscuits will still feel soft but will turn crisp as they cool. After 2-3 minutes, transfer to a wire rack using a palette knife. Allow to cool completely before storing in an airtight container, or place in a ribboned box as a gift.